Quick Draw Nylon Fanny Pack Holster - Only Small size still available. The patented design provides quick access to a securely holstered handgun. The pack has a nylon rip cord that, when pulled downward, opens the whole zippered front of the pack exposing the handgun. Perfect for concealed carry of your defense pistol to allow quicker access in an emergency. Includes velcro'ed holster that is adjustable to allow left or right hand draw. Made from luggage grade Cordura nylon provides a comfortable fit while hiding the outline of the handgun. Fully adjustable 1 1/2" quick release waist belt adjusts up to 52" in length. Includes one Cordura nylon holster with thumb-break that fits most medium and large frame automatics and revolvers with up to a 3" barrel. The holster can be stabilized on your waist belt by a velcro loop on the back. Color is black. 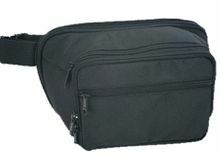 The Small fanny pack main compartment is 8.5 inches wide and 5.5 inches tall. All units include cordura holster with velcro side panels to allow exact positioning for greatest utility. Easy to tell, just google your gun for the dimensions. Make sure to include any lasers or flashlight holders you may have as attachments. Large and Medium sizes out of stock.